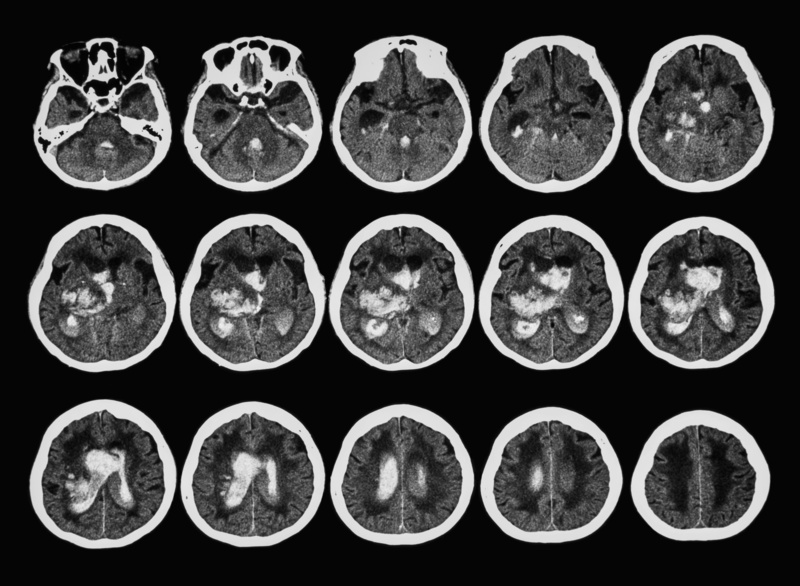 Different imaging methods are available to assess patients presenting with stroke symptoms. The remainder of this blog post will discuss and compare the standard choice of non-contrast CT (NCCT), to the more advanced modalities of CT angiography (CTA) and CT perfusion. Also, several MR techniques including MR angiography and MR perfusion will be assessed, concluding with catheter angiography. The difficulty with detecting the penumbra and the infarct core on CT perfusion, as well as on MR perfusion, is the standardization. To date no common threshold values have been determined. Additionally, the differences in perfusion and processing calculations can generate diverging results, further complicating the standardization of CT/MR perfusion image interpretation.4 To realize the full potential of CTP, a standardized CTP interpretation must be reached. NCCT is still the fastest and most widely accessible method for stroke diagnosis. Including CTA and CT perfusion in the CT imaging protocol in case of non-hemorrhagic stroke provides an increased amount of information on the location of the occlusion and the extent of the infarct core and penumbra. Compared with CT, MR generally provides a higher sensitivity and specificity in the diagnosis of acute ischemic infarction in the immediate hours subsequent to onset. An MR protocol, including MRA and MR perfusion sequences, facilitates retrieval of the same information as an extended CT examination, however, the standard MR protocol for differentiating between ischemic and hemorrhagic stroke takes significantly more time than solely an NCCT. On the other hand, an advantage of MR is the absence of ionizing radiation, but what is the importance of this in (quality of) life threatening situations? Are you curious about what Quantib is doing related to stroke diagnosis? Check out the webpage of our CASE project and learn more about the implementation of the stroke decision support system we are developing together with QMENTA. The top 10 causes of death. (2017). Available at: www.who.int/mediacentre/factsheets/fs310/en/. Stroke association. State of the nation, Stroke statistics. (2016). Available at: www.stroke.org.uk/sites/default/files/stroke_statistics_2015.pdf. Six, O. R. (2018, 2, 22). Email exchange with Deserno, W.M.L.L.G., MD, MSc, PhD. Mair, G. & Wardlaw, J. M. Imaging of acute stroke prior to treatment: current practice and evolving techniques. Br. J. Radiol. 87, 20140216 (2014). Stroke treatments. (2018). Available at: http://www.stroke.org/we-can-help/survivors/just-experienced-stroke/stroke-treatments. Saver, J. L. Time is brain--quantified. Stroke 37, 263–6 (2006). Liebeskind, D. S. Hemorrhagic Stroke Treatment & Management. (2017). Available at: emedicine.medscape.com/article/1916662-treatment. Swaminathan, A. Ischemic Stroke Treatment Archive. Available at: http://rebelem.com/ischemic-stroke-treatment-archive/. Thurnher, M. Brain Ischemia - Imaging in Acute Stroke. Available at: www.radiologyassistant.nl/en/p483910a4b6f14/brain-ischemia-imaging-in-acute-stroke.html. Gao, J. et al. Visibility of CT Early Ischemic Change Is Significantly Associated with Time from Stroke Onset to Baseline Scan beyond the First 3 Hours of Stroke Onset. J. Stroke 19, 340–346 (2017). St-Amant, M. & Jones, J. Hyperdense MCA sign (brain). Available at: radiopaedia.org/articles/hyperdense-mca-sign-brain-1. Guerrero, W. R., Dababneh, H. & Eisenschenk, S. The role of perfusion CT in identifying stroke mimics in the emergency room: a case of status epilepticus presenting with perfusion CT alterations. Int. J. Emerg. Med. 5, 4 (2012). Williams, L. S., Yilmaz, E. Y. & Lopez-Yunez, A. M. Retrospective assessment of initial stroke severity with the NIH Stroke Scale. Stroke 31, 858–62 (2000). Velayudhan, Vinodkumar; Pawha, Puneet; Ferretti, James C; Chen, Yung-Hsin; Tanenbaum, Lawrence N; Patel, Aman B; Naul, L. G. Stroke Imaging. (2018). Available at: emedicine.medscape.com/article/338385-overview. Thurston, M. & Abdrabou, A. CT angiography of the cerebral arteries. Available at: radiopaedia.org/articles/ct-angiography-of-the-cerebral-arteries. Menon, B. K. & Demchuk, A. M. Computed Tomography Angiography in the Assessment of Patients With Stroke/TIA. The Neurohospitalist 1, 187–199 (2011). Ringer, A. Aneurysm embolization: coiling. (2016). Available at: www.mayfieldclinic.com/PE-Coiling.htm. Vymazal, J., Rulseh, A. M., Keller, J. & Janouskova, L. Comparison of CT and MR imaging in ischemic stroke. Insights Imaging 3, 619–627 (2012). CTA (computed tomography angiography). Available at: massgeneral.org/imaging/services/procedure.aspx?id=2257. Nael, K. et al. Six-Minute Magnetic Resonance Imaging Protocol for Evaluation of Acute Ischemic Stroke: Pushing the Boundaries. Stroke 45, 1985–1991 (2014). Sheikh, Z. & Gaillard, F. Ischaemic stroke. Available at: radiopaedia.org/articles/ischaemic-stroke. Leiva-Salinas, C. & Wintermark, M. Imaging of Acute Ischemic Stroke. Neuroimaging Clin. N. Am. 20, 455–468 (2010). Thomalla, G. et al. DWI-FLAIR mismatch for the identification of patients with acute ischaemic stroke within 4·5 h of symptom onset (PRE-FLAIR): a multicentre observational study. Lancet. Neurol. 10, 978–86 (2011). González, R. G., Hirsch, J. A., Lev, M. H., Schaefer, P. W. & Schwamm, L. H. in Acute Ischemic Stroke 115–37 (206AD). Birenbaum, D., Bancroft, L. W. & Felsberg, G. J. Imaging in Acute Stroke. West J Emerg Med. 12, 67–76 (2011). Ishimaru, H. et al. Accuracy of Pre- and Postcontrast 3D Time-of-Flight MR Angiography in Patients with Acute Ischemic Stroke: Correlation with Catheter Angiography. Am. J. Neuroradiol. 28, 923 LP-926 (2007). Lukies, M. & Gaillard, F. CT perfusion in ischaemic stroke. Available at: https://radiopaedia.org/articles/ct-perfusion-in-ischaemic-stroke. Fisher, M. Current Concepts of the Ischemic Penumbra: Introduction. Stroke 35, 2657–2658 (2004). de Lucas, E. M. et al. CT Protocol for Acute Stroke: Tips and Tricks for General Radiologists. RadioGraphics 28, 1673–1687 (2008). Khandelwal, N. CT perfusion in acute stroke. Indian J. Radiol. Imaging 18, 281 (2008). Tomandl, B. F. et al. Comprehensive Imaging of Ischemic Stroke with Multisection CT. RadioGraphics 23, 565–592 (2003). Lui, Y. W., Tang, E. R., Allmendinger, A. M. & Spektor, V. Evaluation of CT Perfusion in the Setting of Cerebral Ischemia: Patterns and Pitfalls. Am. J. Neuroradiol. 31, 1552–1563 (2010). Essig, M. et al. Perfusion MRI: The Five Most Frequently Asked Technical Questions. Am. J. Roentgenol. 200, 24–34 (2013). St-Amant, M. & Gaillard, F. Intracranial haemorrhage. Available at: radiopaedia.org/articles/intracranial-haemorrhage.